This morning I was thinking about professional learning communities and started to write about them having so many implemented so poorly. But as I thought further about the big ideas of PLCs and the kinds of questions teachers tend to ask, I wondered why teachers ask those kinds of questions. I started thinking about my own pre-standards education and that led to investigate the history of standards-based education. 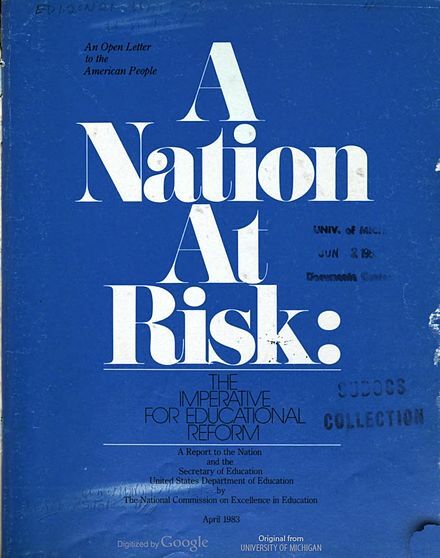 n 1983, the National Commission on Excellence in Education, formed by then-U.S. Secretary of Education Terrell H. Bell, published the report A Nation at Risk in which the members of the Commission stated: "We report to the American people that while we can take justifiable pride in what our schools and colleges have historically accomplished and contributed to the United States and the well-being of its people, the educational foundations of our society are presently being eroded by a rising tide of mediocrity that threatens our very future as a Nation and a people." ASCD reports that the “strident rhetoric has long overshadowed the fact that its appraisal and predictions of educational disaster were so astonishingly wrong and the exact opposite of what has happened” (p. 2). The report itself states “[o]ur society and its educational institutions seem to have lost sight of the basic purposes of schooling, and of the high expectations and disciplined effort needed to attain them.” Perceptions like that put my teeth on edge. I review the list of the members of the Commission, but did not want to take the time to do a deep search on each of their backgrounds. 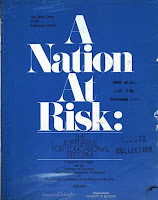 Instead I thought about what was happening in the early 80s and during the 18 months the Commission conducted its research and wrote its report. I thought about Reagan’s America then: the Strategic Defense Initiative, the Challenger missions, the then-USSR and the US conducting nuclear tests, Sandra Day O’Connor becomes a Supreme Court justice, etc. It was a tumultuous time. I can see where educational leaders, still recovering from the 60s and 70s, trying to assess the coming changes in the 80s, including the rise of computers. Technology must have been terrifying for educational leadership. There were incredible disruptions in multiple avenues, I can imagine those educational leaders clinging to the need to retain control of education the way a rider grips the safety harness of a roller coaster. What better way to exert control than to establish standards and specific criteria that had to met if one was to demonstrate a worthy education. The risk is not only that the Japanese make automobiles more efficiently than Americans and have government subsidies for development and export. It is not just that the South Koreans recently built the world's most efficient steel mill, or that American machine tools, once the pride of the world, are being displaced by German products. It is also that these developments signify a redistribution of trained capability throughout the globe. Knowledge, learning, information, and skilled intelligence are the new raw materials of international commerce and are today spreading throughout the world as vigorously as miracle drugs, synthetic fertilizers, and blue jeans did earlier. If only to keep and improve on the slim competitive edge we still retain in world markets, we must dedicate ourselves to the reform of our educational system for the benefit of all--old and young alike, affluent and poor, majority and minority. Learning is the indispensable investment required for success in the "information age" we are entering (“The Risk”). Part of me applauds the enthusiasm for and esteem in which education is held, but another part bemoans the short-sightedness of this thinking. They were so close with that phrase “[k]nowledge, learning, information, and skilled intelligence. . . “ but without the recognition that this new world of learning needed to reflect and leverage the powers of the new and possible rather than rely on scaffolded and puffed old strategies and thinking. The Commission even noted that there was “demand for highly skilled workers in new fields” because “[c]omputers and computer-controlled equipment are penetrating every aspect of our lives” and that “[t]echnology is radically transforming a host of other occupations (“Indicators of the Risk”). Then why rely on more of the same and the old rather than invite learning strategies and thinking that could propel the United States even further? Fear of the unknown? Maybe. From their work, the Commission offered several recommendations. The first focused on content and introduced what they called “Five New Basics”: English, math, science, social studies, and computer science. They also recommended two years of foreign language in high school. And then the music died. It is my belief that the moment we acceded to the idea that grades were a true indicator of academic achievement and that standardized tests told us anything of value about a student’s learning, we were mired in a mess of mazes from which there is no easy escape. Too many businesses have built entire industries on the premise that grades indicate a student’s academic achievement and that standardized tests measure something we need to know. Yet those of us who were nominal B students and managed to do reasonably well on standardized tests, even under adverse conditions, can attest to the balderdash of those beliefs. The concept of professional learning communities was being studied in the 1980s and 1990s. Here we are in 2018 and still fighting the suffocating constraints of standardized tests and the limiting ideas of grades. Pick any imagery of something trapped and striving to escape that trap and that’s where we are now. Confounded by state and federal policies even when we know to the core of our beings that so much of what we’re doing in education does not make sense. We can’t just cast off grades and standardized tests. I know that. But we can start to make inroads to change how we do what we do, and how we work within those constraints and still do what’s best for the students and their learning. How? I have some thoughts on that and we’ll start with professional learning communities and how we can make those work more effectively for students, teachers, and administrators. More to come. Ansary, Tamin. (2007). Education at Risk: Fallout from a Flawed Report.